The Gallus Detox Method provides you or your loved with a safe, comfortable drug or alcohol withdrawal. We use IV therapy during our medical detox programs to help manage withdrawal symptoms. During your stay, our Licensed Substance Abuse Counselors will discuss options that will help you continue your plan for recovery. 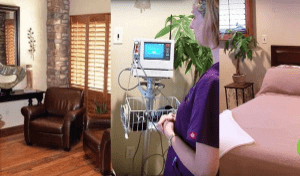 IV Therapy Detox is a critical piece of our detox treatment because it allows us to increase, decrease, or change medications on a moment’s notice to provide instant comfort. Based on your withdrawal symptoms, we will customize your treatment at any given moment and adjust your medications accordingly. While yoga, meditation, saunas, and herbs may be helpful in 30, 60, and 90-day rehab programs, suffering in extreme discomfort through a “cold turkey” detox is not only unneeded but in certain cases can be life threatening. Gallus Detox Centers understands that your comfort during drug or alcohol detox programs is essential to a successful outcome. Using the evidence-based Gallus Detox Method, we continuously strive to deliver expert medical care. Our caring addiction treatment staff makes every effort to give our patients a comfortable, luxurious, “home-like” atmosphere. We understand that staying in communication with your family and friends can enhance your chances of success. We also understand that many individuals have obligations outside of treatment. During your stay, you can use our in-house Wi-Fi services. Your cell phone, laptop, and all other electronic devices are available at all times, except in extreme cases. Struggling with addiction? You can count on the Gallus Detox Method to help you start recovering. Call us today at 888-306-3122.